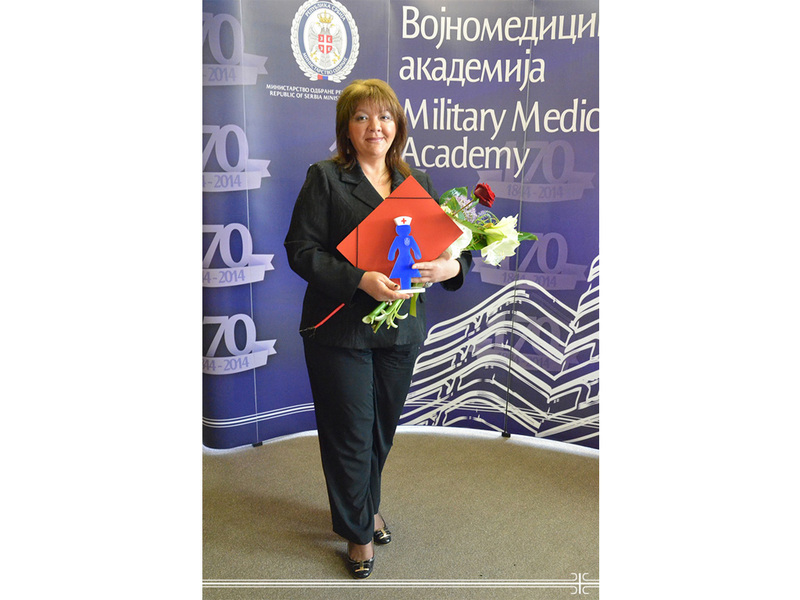 On occasion of the International Nurses Day and marking the 170th anniversary of the Military Medical Academy, the best MMA medical nurses and technicians during 2013 were awarded distinctions and certificates of merit. The event was welcomed by MMA Deputy Head Colonel Prof. Dr. Dragan Dincic who emphasized the contribution of nursing profession for Military Medical Academy operating activity and reputation. He also pointed out the fact that named institution will continue to support, as much as it can, its professional development, especially when speaking about continuous medical education field. The MMA Head Nurse Verica Milanovic, President of the Serbian Association of Medical Nurses, Technicians and Midwives, met the attendees with the historical path of nursing profession in Serbia and whole military healthcare system. Head Nurse of the Psychiatry Clinic Vesna Cmiljanic was nominated the nurse of the year 2013. Among the surgical clinics the best nurse is Bojana Kojcic from the MMA Clinic for Anesthesiology and Intensive Care, while the best nurse in internal domain is Nadica Vlajic, employee at the Clinic for Emergency Internal Medicine. Specialist Outpatient Clinic awarded nurse Radmila Lacmanovic and MMA centers nurse Zorica Tanasic from the National Poison Control Center. Artistic part of the solemn program was supported by actresses Rada Djuricin and Biljana Djurovic and young pianist Emilija Matic. Celebration continued with professional accredited lecture, approved by International Council of Nurses carrying the title: "Nursing- Health Force- Conscience and Responsibility in Developing Professional Identity".